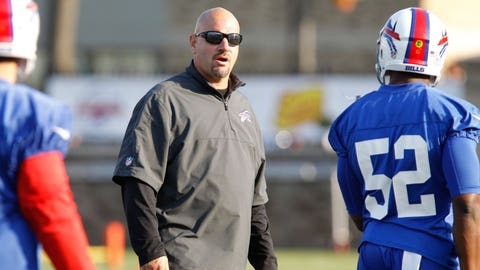 MOBILE, Ala. – The Cleveland Browns took their coaching search on the road Tuesday night for a second interview with Buffalo Bills defensive coordinator Mike Pettine. Per Cleveland WKYC TV’s Jim Donovan, the two sides met but no offer was made. Presumably, the search that’s now in its fourth full week continues. Earlier Tuesday, FOXSports.com’s Alex Marvez reported that the Browns would interview Atlanta Falcons offensive coordinator Dirk Koetter. Koetter is working in Mobile this week as the Falcons coach the North team during Senior Bowl activities. The report of the team’s interest in Koetter and the second interview in five days for Pettine came after reports that Denver Broncos offensive coordinator Adam Gase informed the Browns he wasn’t interested in interviewing for the jobs. The Cleveland Plain Dealer reported late Tuesday night that the Browns left Mobile after the Pettine interview for another interview. As the Browns stated they would the day after firing Rob Chudzinski, they haven’t offered public comment on any part of the search, hence the number of reports and rumors and sources either confirming or denying stories and candidates over the last four weeks. Last Wednesday, owner Jimmy Haslam wrote a letter to season ticket holders that was also posted on the team website promising, among other things, that the search was "purposefully methodical." It’s believed Koetter, assuming he interviews with the Browns team of Haslam, CEO Joe Banner, general manager Mike Lombardi and team president Alec Scheiner, will be the 10th candidate to whom the Browns have spoken. The Browns went on the road last January during their coaching search and returned with Chudzinski, who flew back from Charlotte and was introduced the morning after his second meeting with the team.